Read an interview with Farmer Partner Brian MacWhorter here. 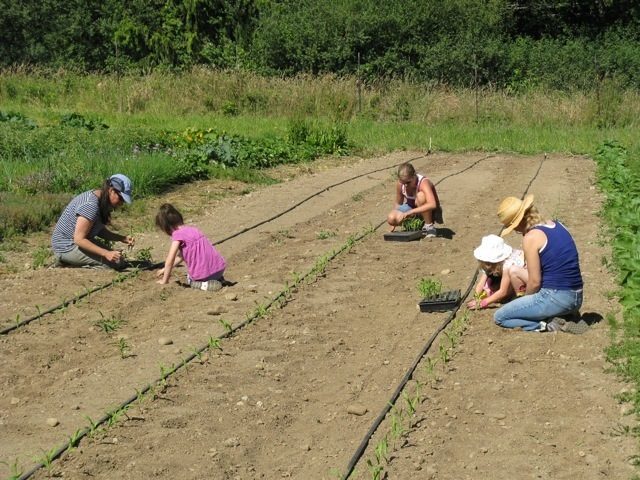 Through the educational interest and generosity of Butler Green Farms and Friends of the Farms a parcel of public land at the Morales Farm was set aside for dedicated farm-school programs on Bainbridge. Master farmers Brian MacWhorter (Butler Green Farms), Betsey Wittick (Laughing Crow Farm), and Karen Selvar (Bainbridge Island Farms) provided the agricultural integrity and authenticity to get the edible program off the ground. Our edible education plot is meant to have students modeling what they see our master farmers growing on neighboring farmland. Today, local schools visit these farms for edible education programs and food from these farms is being served in Bainbridge School District lunches, through our Bite of Bainbridge program. The Morales Farm, located on the corner of Highway 305 and Lovgreen Road, is one of Bainbridge Island’s oldest working farms. Teddy Morales moved to the region in 1929 at age 16, where he joined relatives in doing seasonal farming up and down the west coast. After serving in WWII, Teddy and his first wife Gloria Paul settled on the island to raise four children and to help farm his cousin’s Lovgreen property. Teddy traded his expertise and help on the farm for 5 acres of the land, which makes up what we know today as the Morales Farm. During the height of the season, the farm produced an average of 800 ears of corn each day. Teddy and his second wife Tita grew “berries and a variety of vegetables sown in perfectly straight rows over the sunny rise of their property. Their neatly trimmed farm is one of the cornerstones of our rich agricultural heritage”. 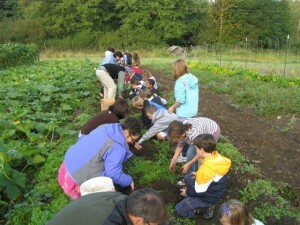 Wilkes Elementary students & parents harvesting. The produce harvested from the demonstration farm plot at Morales Farm is donated to the Bite of Bainbridge. This fresh, sustainably grown food comes to the school lunch menu through a ground breaking farm to school program involving Butler Green Farms, Laughing Crow Farm, Bainbridge Island Farms, Bainbridge Island School District, Friends of the Farms, City of Bainbridge Island and The EduCulture Project at Global Source Education, which developed and coordinated the program. Please visit the Bainbridge Island School District online to learn more about their Farm to Cafeteria program. 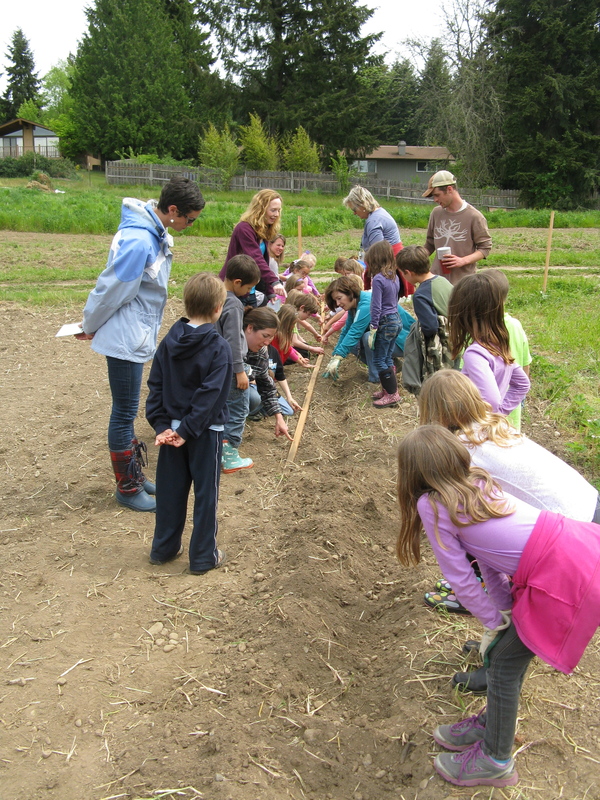 Students from Wilkes Elementary, Ordway Elementary, and Island Cooperative Preschool seeded many crops, including heirloom potatoes, sugar pie pumpkins, watermelons, zucchini, braising greens, and flowers for pollinators. 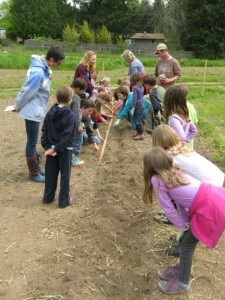 Our demonstration plot also features a sunflower house, planned and planted by Island Cooperative preschoolers. This fall will truly look extraordinary! 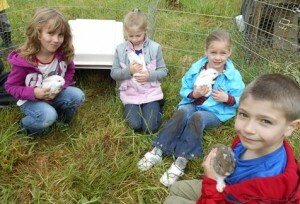 New to the farm this season are our 7 worker rabbits, eating weeds and fertilizing the fields. 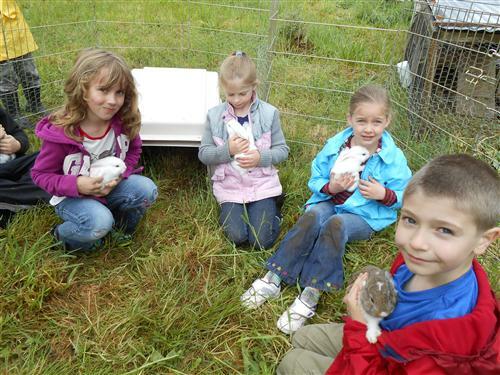 Students have been assisting in taming these new rabbits, as well as feeding our heritage breed chickens and collecting eggs.